The PC-6000 series (PC-6000シリーズ) is a range of computers manufactured between November 1981 and 198x by NEC. The PC-6000 series began with the launch of the PC-6001, being offered as a cheaper alternative to NEC's more high-end PC-8800 series which debuted around the same period, and in some ways replacing the PC-8000 series which had debuted some years before. 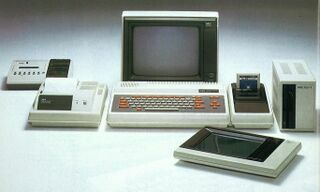 Throughout its lifespan, this line was marketed as the entry level option for NEC computers - the PC-8800 series occupying a middle ground and the PC-9800 series being offered as high-end machines, neither set of machines being compatible with the others. For information, see PC-6000 series. Pages in category "PC-6000 series"